Will Europe wake up to China in 2016? The year 2015 was not a good year for the European Union (EU). By common consensus, it failed to handle the Syrian refugee crisis efficiently. It also continued to let Greece wallow in its debt crisis with no clear resolution. To compound these woes, the overall EU economy remained more-or-less stagnant. Additionally, amidst all these unsolved and pressing problems, the EU again failed to develop a clear policy direction toward China. The EU's Common Foreign and Security Policy (CFSP) has never been well implemented since its inception in the 1990s; but since the emergence of China onto the world stage is not exactly a new story, there is really no excuse for a lack of concerted action. 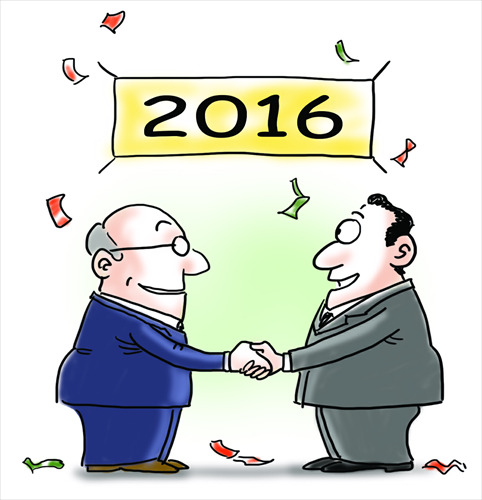 However, there are signs that 2016 may represent a turning point in Europe's attitude toward China. It is at least necessary for observers on both sides of the Europe-China divide to be both patient and optimistic, since the slow-turning cogs in the Brussels machine certainly need plenty of oiling. Nevertheless, it seems that there could be some "oil" in the offing in the form of a new initiative to kick start the European economy while improving connections across the Eurasian landmass. The justification for taking a more positive view of both the EU and EU-China relations comes in the form of the so-called "Juncker plan", or (to give it its proper name) the new European Fund for Strategic Investments. Named after the European Commission President Jean-Claude Juncker, this fund aims to raise at least 315 billion euros ($394 billion) by the end of 2017. The money is supposed to come from private investors, including Chinese ones, and the cash pot will be used to "channel investments where they are most needed." Now, the phrase "where they are most needed" is pretty vague and open to interpretation. Given the EU's record of wasting money on ill-conceived projects and bureaucracy over the last 20 years, one cannot look at this proposal through spectacles that are too rose-tinted, for fear of yet again being disappointed. On the other hand, the Netherlands has just taken over the EU presidency for six months, its first since 2004, and has given strong indications that it intends to be proactive in bringing the Juncker plan to fruition as swiftly as possible. In addition, the Clingendael Institute, which has considerable influence in Dutch policy-making as the country's foremost think tank on foreign policy and international affairs, published a paper in December suggesting that the Juncker plan and other already existing initiatives and frameworks provide a way for Europe to focus on building infrastructure. One aim of such construction, the report states, should be to connect to China's "One Belt, One Road" (OBOR) project. This means that there is an excellent window of opportunity right now for building a foundation not only for European growth, but also for developing infrastructure projects which link to OBOR, making the long-held dream of a modern-day Silk Road a potential reality. In other words, these are exciting times for those who believe that the best way to achieve peace and prosperity across the geographical areas which are home to the majority of humanity is to ensure that East Asia and Europe are well-connected and working in harmony with each other. Building good infrastructure connections such as railways, roads and ports between the EU and China should have the considerable advantage of benefiting not only these two major global actors but also all the countries in between, many of which are troubled, impoverished and underdeveloped. If the EU can develop specific infrastructure projects which align with China's OBOR initiative, which is already having an impact on Central, Eastern and Southern Europe, then such action would result, to use a well-worn but appropriate cliché, in a win-win situation for both sides. So, all in all, the time is ripe for the EU to wake up to China's activism and to take some action of its own. Only time will tell if it will do so; but the first half of 2016 certainly presents an outstanding opportunity for Europe to finally implement some unified and realistic policy toward China. In this way, the EU can both develop its economy and also contribute to more prosperous and peaceful conditions across the Eurasian landmass.